When you attend the Gaume festival in Eastern Belgium, you happily acquiesce to the choices of Jean-Pierre Bissot, one of the most imaginative promoters and organisers in Europe, and his close-knit group of helpers. "It's a family affair," wrote Alison Bentley's in her round-up last year. This year that congenial vibe was put to the test by the terrible weather on both Friday and Sunday. It failed to dampen the energy of the festival's music, but it did mean that it wasn't possible to enjoy the outside area as much as one should have (especially for the local Orval and Rulles beers to be enjoyed with burger of hot dog). Two concerts really suffered from the storm: the Finnish group Gourmet, and also the set by up-and-coming French vocalist Leila Martial which had been developing in a striking manner, until the moment when it was cut cruelly short. A regular highlight of this festival is the commitment to premieres and commissions, in which invited musicians are given a “carte blanche.” There was one of these on each day, and they proved a very diverse bunch indeed. On Friday this slot went to Mik Mâäk, an extended version of Mâäk's Spirit, one of the leading collectives, focussing on horns and wind instruments. By now the members of this group are stars in their own right, such as trumpeter Laurent Blondiau and saxophonist Guillaume Orti. Telling contributions also came from Michel Massot on tuba and from Fabio Biondini on piano. It started the main festival off with style, making up for the horrific outside weather. Saturday's commission was entrusted to Igor Gehenot, the new rising star of Belgian piano who played at the Vortex in the 2013 London Jazz Festival, melded his own trio with the Polish Atom String Quartet, which some of the newly emergent quartets in Europe (such as Zapp in Netherlands or Elysian in the UK) we have musicians who can not just play as a tight ensemble but are all strong improvisers. As might be expected from such a new collaboration it still remained a bit tentative, focussing much on Gehenot's melodic approach. A few more performances will probably give it a refreshing dynamism. The third commission went to Antoine Pierre, a young drummer en route to New York. The focus of the show was Enrico Pieranunzi, playing a number of his tunes, first as a lyrical trio with Pierre and Philippe Aerts, who is a bassist to choose when lyricism is required. We had heard Aerts with Igor Gehenot earlier and a highlight in 2013 has been when he worked with Nathalie Loriers and Tineke Postma. The horn section was extended to include Steve Houben on alto and Antoine's guitarist father proudly sat in on 12 string guitar. A fine celebration and send-off. As ever, there were a number of other memorable concerts. Atom String Quartet moved to the more intimate setting of the church on Sunday and gave a performance of their own music which was gripping. One minute sounding like Bartok, the next like one of the string quartets playing the music of Zorn. Poland has a great tradition of violinists in jazz, such as Zbigniew Seifert and Michal Urbaniak and they take this one level further. Watch this space, certainly. Another on the main stage was a trio of Majjid Bekkas, who is equally versed in North African and European improvisational styles. 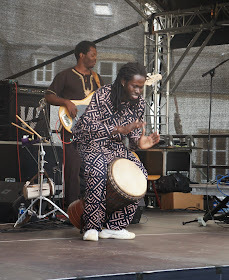 He helps Jean-Pierre Bissot programme the Jazz au Chellah festival in Rabat in Morocco (2013 reviewed here). He plays in the trio of Joachim Kühn on guimbri, the punchy three-string bass lute. Here his Afro-Oriental Trio, where he played oud as well as guimbri, evoked the sound world of the likes of Anouar Brahem, with Khalid Khouen on percussion and tabla, and Manu Hermia on saxophones. Hermia is a player with an equal awareness of how to merge global sounds within the jazz context, as I have heard on several occasions here at Gaume, though he has not ventured enough to the UK. (Indeed, I heard about a new trio that he is doing with Sylvain Darrifourcq, the drummer in Barbacana with Kit Downes and James Allsopp.) The interplay, such as on Don Cherry's Mopti, was exquisite and the new album, to appear on Igloo, is eagerly awaited. Drummer Teun Verbruggen performed for the second time in a piano trio with Pierre de Surgeres, a trio that focussed more on rhythm and harmony than Gehenot. A chance to site in the front row by Verbruggen gave a chance to appreciate why has become one of the “go-to” drummers in Belgium. He has been in London several times with Flat Earth Society and his own Bureau of Atomic Tourism and he will be back in the trio Too Noisy Fish in London in September. Gaume this year had a number of the newer generation of Israeli musicians. Ofri Nehemya has become, at 19, Avishai Cohen's drummer, and so expectations are high. He presented his own quartet of young cohorts. Assured as with many such groups, but, hopefully, to develop his unique voice soon. Solo bassist Adam Ben-Ezra performed on the outdoor stage. Judicious use of looping and effects allowed him to build the instrument to be a fully-fledged accompaniment to his singing. Jean-Philippe Collard-Neven is a classically-oriented pianist and, on Sunday afternoon, he managed to make the main tent seem like an intimate club venue in his thoughtful solo set where his melodic inner voicings were a joy. Saturday was dry and Afrikän Protoköl were much appreciated, particularly for their ability to meld West African and Western European music in a way that encouraged dancing. They reminded me of Outhouse Ruhabi and Fofoulah, though they took their African influence from Burkina Faso rather than The Gambia. This year's festival was the 30th and all congratulations to Jean-Pierre and the team for achieving such a milestone. Nestling in the Ardennes, you wouldn't expect such a forward-looking event. Irrespective of the natural beauty of the area, such as the wine-growing region around Torgny, or the meandering Sémois, this festival has become an essential attraction for the region and here's hoping that this beacon for contemporary jazz continues for many years! It's so easy to get to from London by train, and is just 3 miles from the main line from Brussels to Luxembourg. The Gaume Jazz Festival is produced by the Jeunesses Musicales du Luxembourg belge.